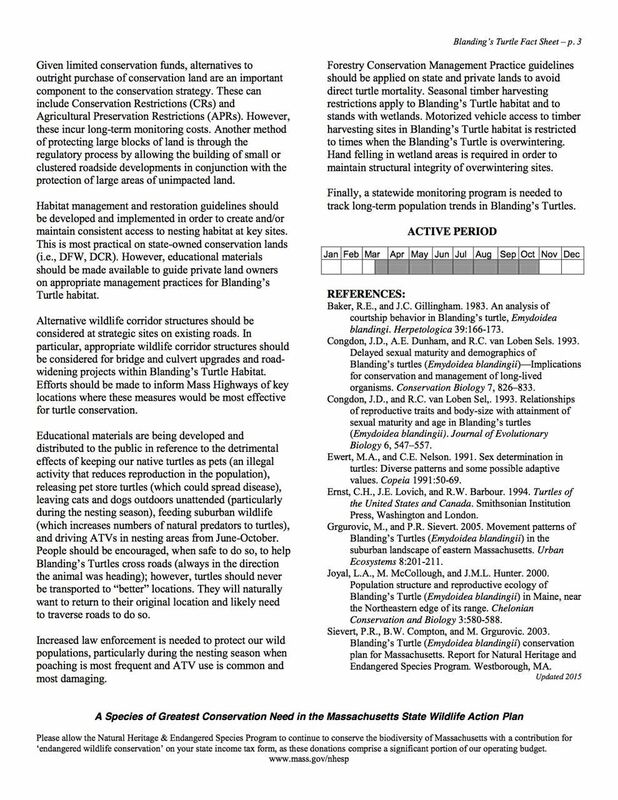 The Blanding's Turtle is Threatened under the Massachusetts Endangered Species Act - It’s illegal to kill, harass, collect, or possess this turtle. Found in the eastern half of the state, it has a dark body and a bright yellow throat, and grows up to 9” long. 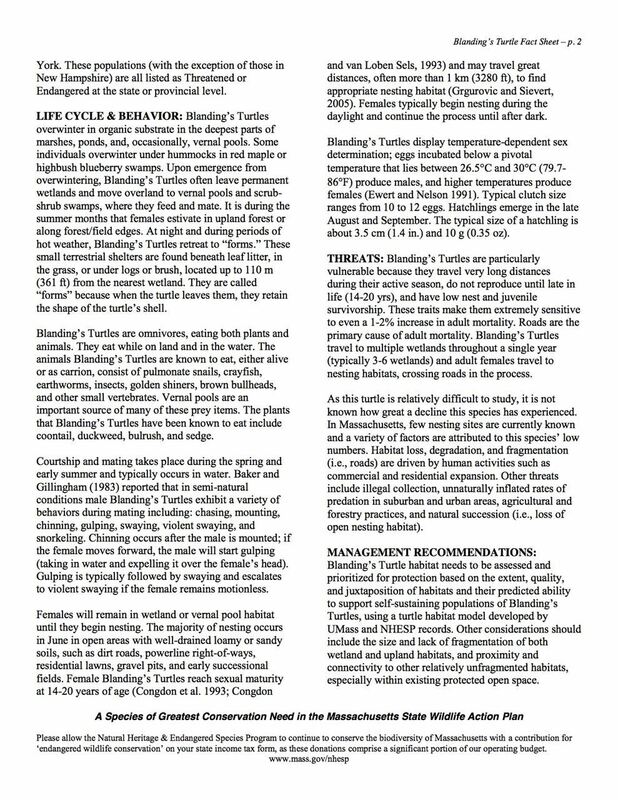 The female reaches sexual maturity at 14-20 years, hence the critical importance to preserve the Blanding's habitat in order to ensure the species survival rate. This turtle has a documented longevity of 83 years since its been studied. It inhabits a variety of habitat types, and eats both plants, such as duckweed and sedges, and animals, such as fish and snails. 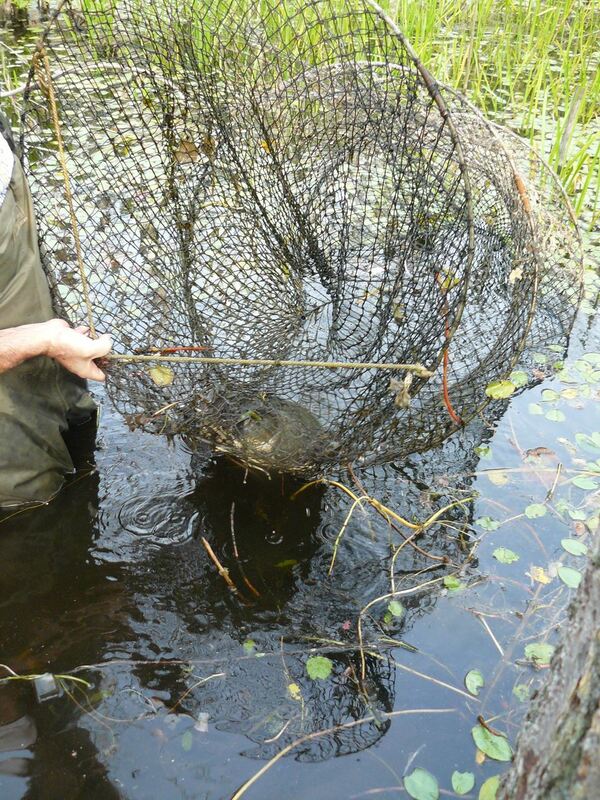 Why is the Cape Ann Vernal Pond Team trapping Blanding's Turtles? 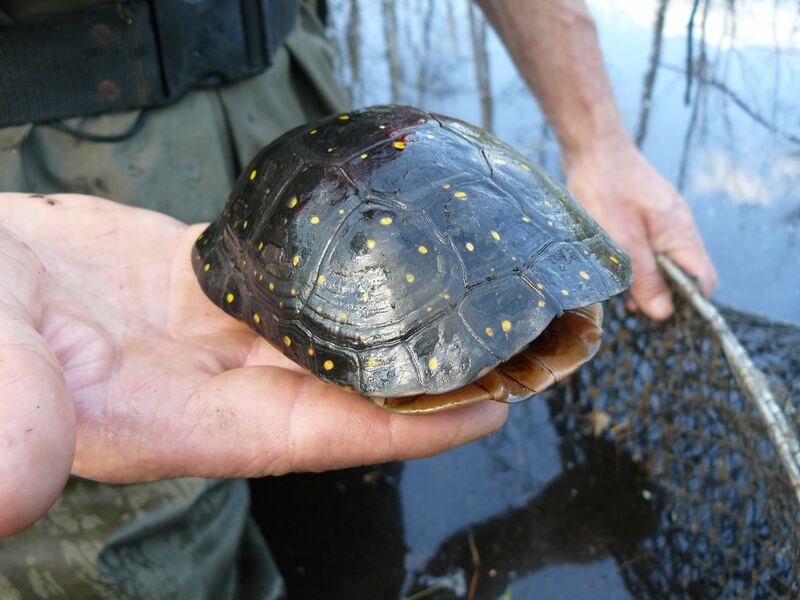 Did you know there are historic records referencing Blanding's Turtles on Cape Ann? In fact, these lovely turtles were documented just a half mile away from the wetland where we have been turtle trapping this year, and easily within this turtle's range. If there are any here now, there sure aren't many, but we would like to know it. We're one of the few organizations out here trapping turtles on Cape Ann to see if we can find them... but we haven't found any yet . 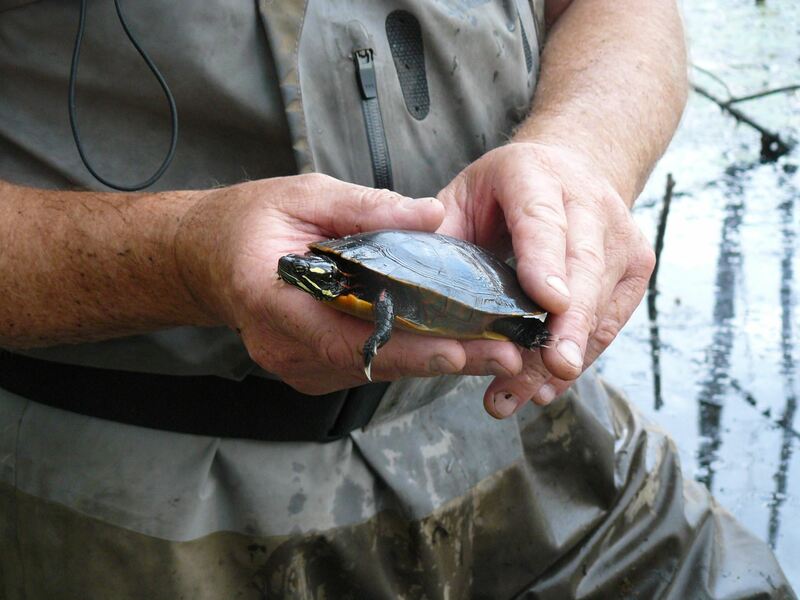 We are trapping in an effort to assist with assessment and protection of the Blanding's Turtle populations in the Cape Ann area. 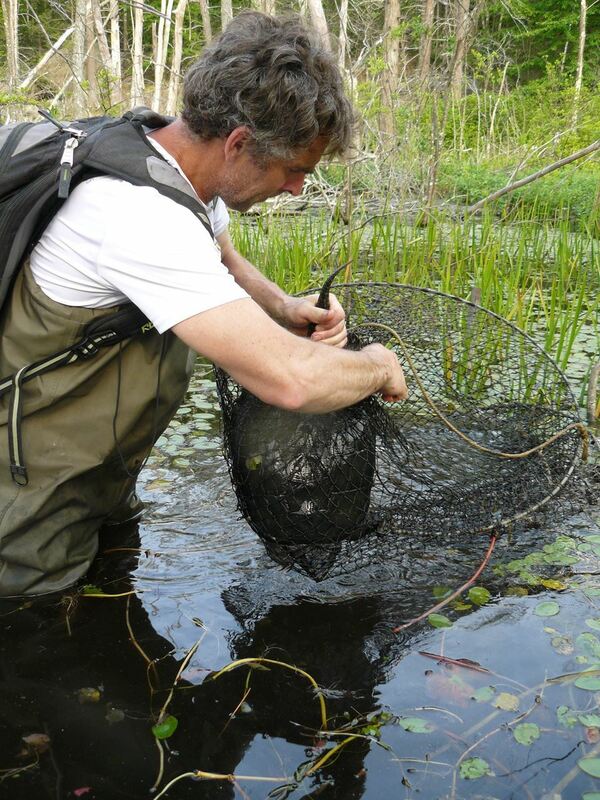 Below you will see photographs of the Cape Ann Vernal Pond Team out in the field doing turtle surveys trying to trap and locate Blanding's Turtles. 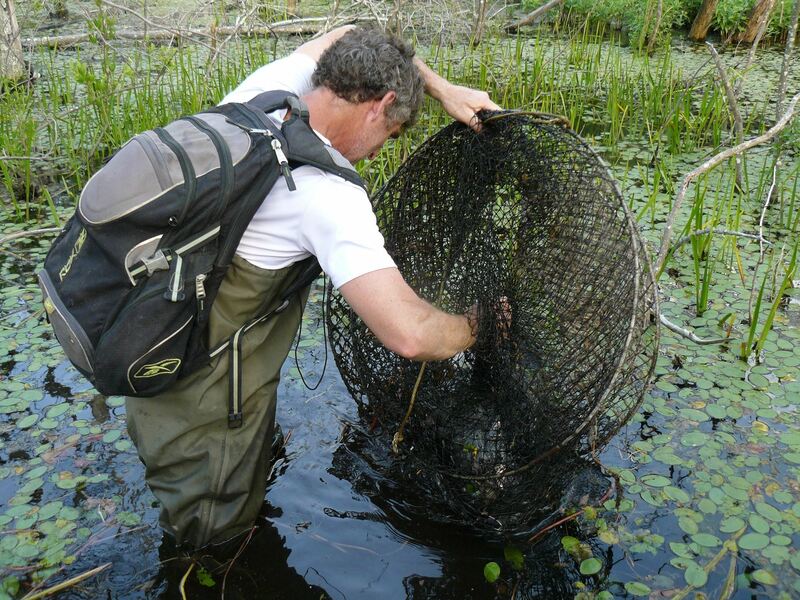 We go out to the wetland and set, bait, and stake the traps in place. 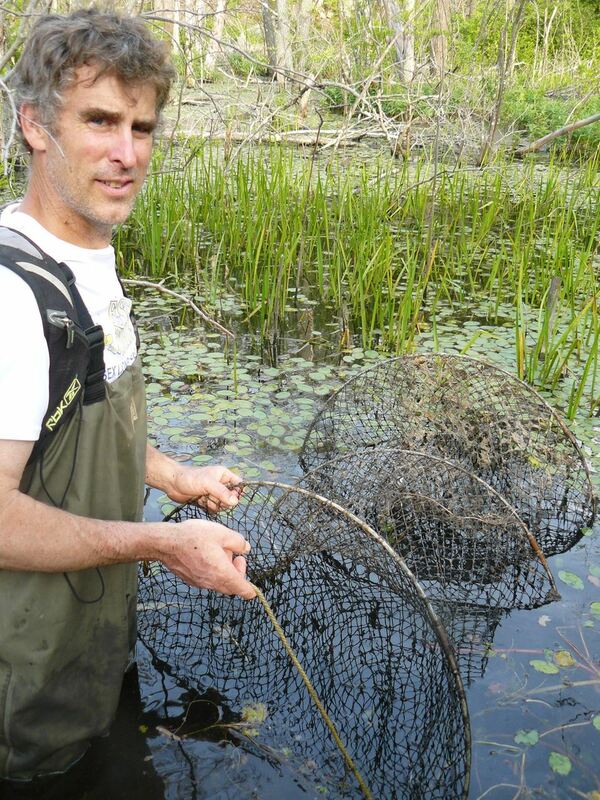 We return and check the traps for turtles and rebait them. 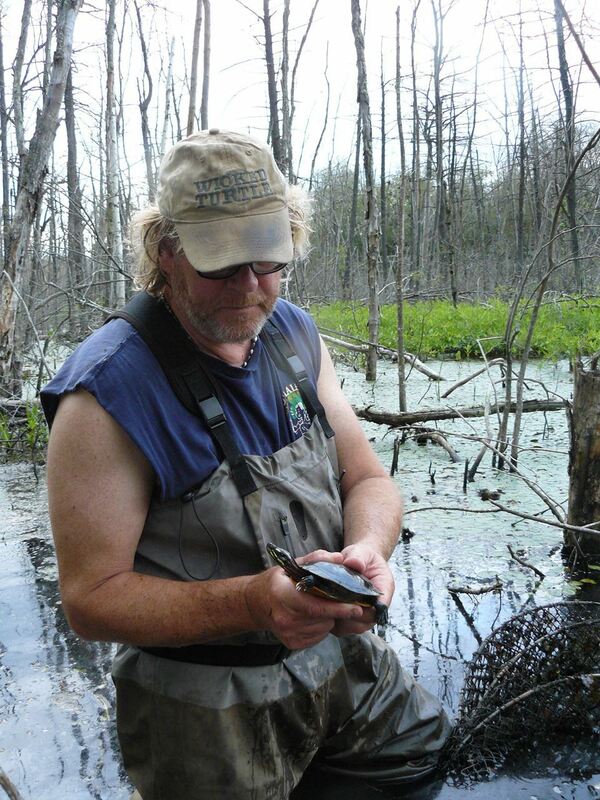 This spring our Team was in the field about 60 times trapping the illusive Blanding's Turtle, as well as documenting our findings on other species of turtles. 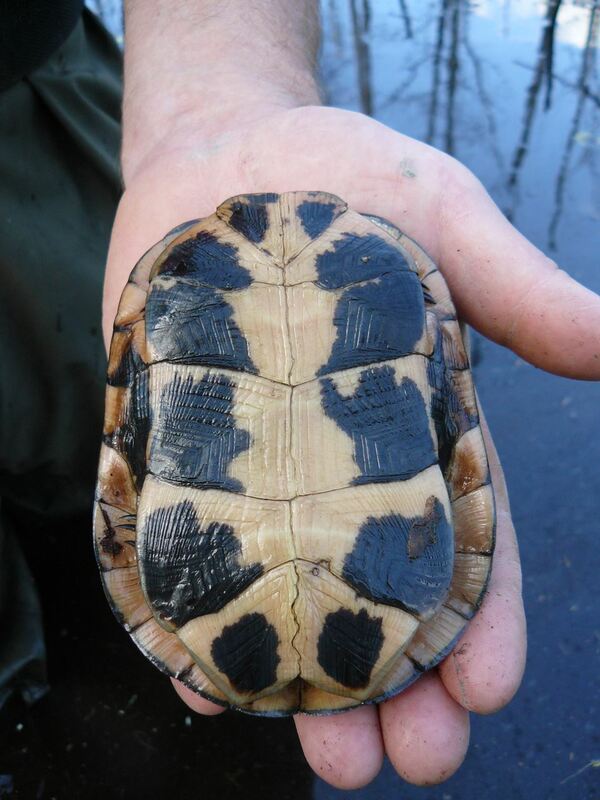 Check out some of the various turtles we've encounter... like the native Painted Turtle, spectacular Spotted Turtle or cute little Snapper... ouch! 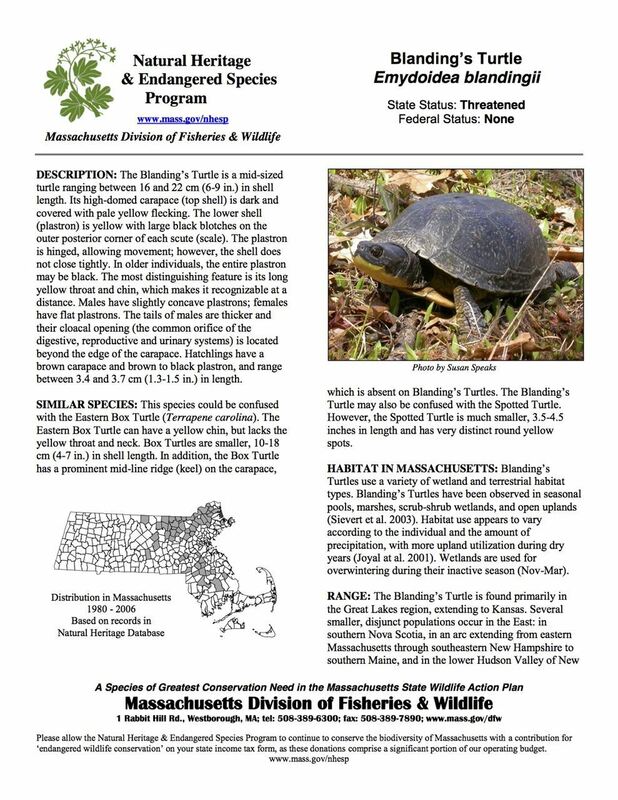 In addition, more detailed information about the Blanding's Turtle in Massachusetts is documented in the Natural Heritage & Endangered Species Program Fact Sheet at the bottom of this page. Photographs on this page compliments of Keith Bertone, Nick Taormina and Rick Roth, unless otherwise noted. Three guys out having fun... trying to save the world! 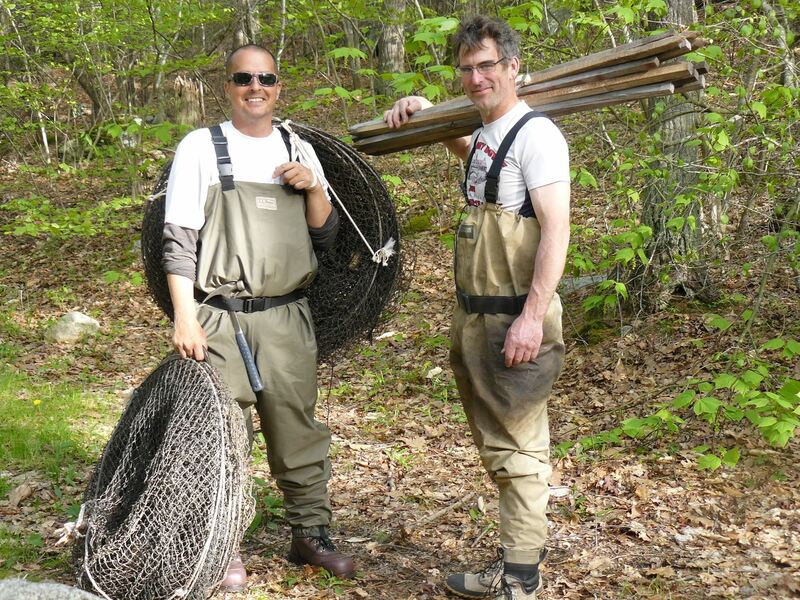 Keith Bertone, Nick Taormina and Rick Roth out turtle trapping. It’s common and native throughout the state in shallow bodies of water that offer places to bask. In fact, it can spend as many as six hours a day basking in the sun! It grows up to 8” long. It has a smooth olive shell and yellow stripes on its head, with two distinctive yellow spots behind each eye. Its diet is varied and includes aquatic plants, small fish, and snails. It's great we found this Spotted Turtle here on Cape Ann because their habitat is similar to that of the Blanding's Turtle. Yikes... Watch your fingers Mr. Nick! 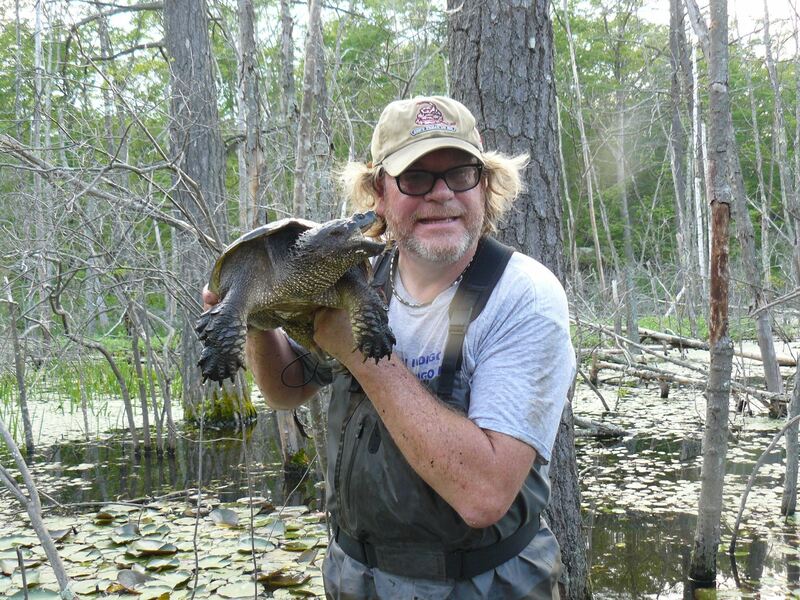 Found in all sorts of water bodies, from rivers to lakes to marshes, the snapping turtle can grow to over 20” long. It has three ridges on its carapace, as well as a spiky tail. It eats many different plants and animals, and becomes more vegetarian as it ages. 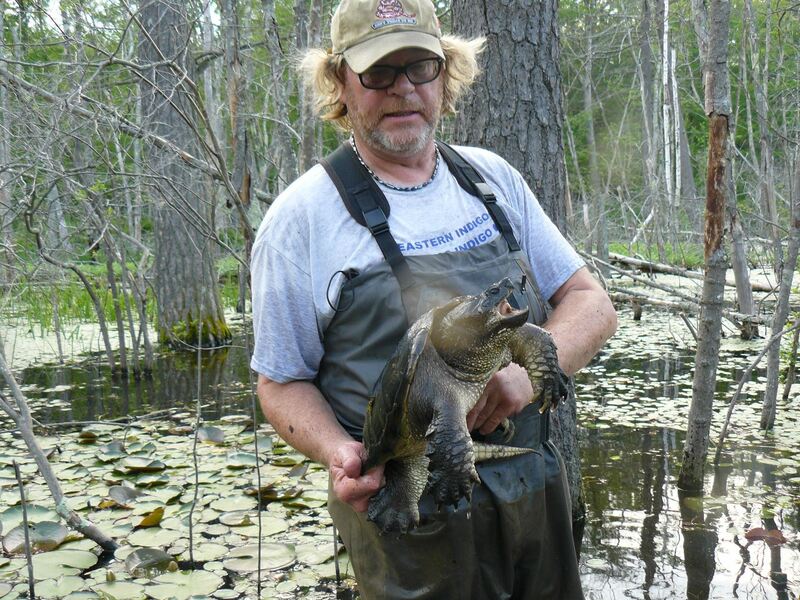 Snapping turtles can be aggressive and deliver a painful bite if threatened, possibly because their small lower shell (plastron) leaves them vulnerable. Give them plenty of space, and be aware that their neck can stretch the length of the shell. Never grab one by the tail—you could seriously injure the turtle.